Roberto Heras has been suspended by his Liberty Seguros team after a suspected positive test for the blood-boosting substance erythropoietin (EPO). 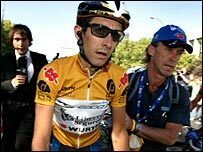 Heras, 31, a former US Postal team-mate of Lance Armstrong, won a record fourth Tour of Spain in September. Despite the suspension, Liberty Seguros said it believed the Spaniard will be able to "prove his innocence". "The only thing I can think of is that it is a laboratory error," Heras told Spanish radio. "My lawyers and the team are working on the case as we speak and there will be a B test on 21 November. "I don't want to start speculating about whether the samples could have been mixed up, but when they open the samples for the second test we want to be there." Liberty Seguros said it was told by cycling's governing body on 27 October that Heras had tested positive for EPO. It added that leaks to the media on Monday night had persuaded them to make a statement. Heras is renowned as one of the world's best climbers and had previously won the Tour of Spain in 2000, 2003 and 2004. The team said "respect for the principle of innocence and a desire to wait for the B test" had originally made the Liberty Seguros board decide not to make the news public. The test took place on the penultimate Vuelta stage, the time trial between Guadalajara and Alcala de Henares on 17 September, in which Heras was runner-up.